At this point in time last year the only I made a similar list detailing my preseason favorites to win the 2009 Simone Award. The list included Olathe North's James Franklin (who obviously won the award), Blue Valley's Anthony Abenoja, Rockhurst's Sal Belfonte, Blue Springs' Keeston Terry, Free State's Camren Torneden and Bishop Miege's Justin McCay. As it turned out, Franklin was the only player on the list who was among the top four for the presitgious award (although it's worth noting that Terry won the Taylor Award as the top receiver in Kansas City). Last year's results indicated two things. Most importantly, a player who is a finalist as a junior has a pretty decent shot at winning the award as a senior. Franklin, as well as 2008 winner Blaine Dalton were each finalists following their junior seasons and won the award as seniors. 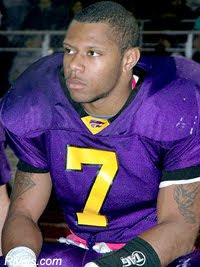 The only junior finalist in 2009 was Blue Springs running back Darrian Miller. The second key thing to note is that the award is really a crapshoot--a sample of the the greater whole that is high school football. In 2003 Rockhurst's Tony Temple was the talk of the Kansas City high school football scene. Temple was being hailed as the greatest high school football player in the history of the city, and was an overwhelming favorite to win the Simone Award in his fourth season as a starting running back. 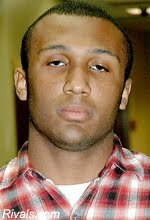 In the first game of the 2003 season Temple rushed for 249 yards and four touchdowns and was named the USA Today high school football player of the week. In week two Temple suffered a shoulder injury that virtually ended his senior season of high school football and chances of winning the Simone Award. In 2007 the Simone was awarded to Rockhurst's Nathan Scheelhaase, the first junior to ever win the award. 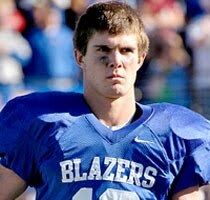 Scheelhaase looked like a lock to claim the award again in 2008, but in the end Dalton from rival Blue Springs South won the award. Despite all the uncertainty, I have formulated a list of six players who I feel have the best chances at winning the award. Simmons notoriety in Kansas City received a huge boost a week ago when he was offered by Kansas and shortly thereafter committed to the Jayhawks. Notoriety, after all, is perhaps the biggest key to winning the Simone Award and for Simmons he is now a household name with thousands of Kansas alumni throughout Kansas City. The biggest knock on Simmons is that he is simply a glorified running back. Simmons didn't do much passing for Olathe North last season, that duty was left to the other Eagle quarterback David Blazevic. Simmons primary role was executing the zone read option. He did well rushing for over 1,000 yards and he also helped Olathe North out in the defensive backfield. Ultimately the team won the 6A crown with the major boost that Simmons provided as a running threat. Olathe North, like Blue Springs, will be receving a great deal of publicity in Kansas City and Simmons had a chance to impress many of the Kansas alumni who are looking forward to seeing him play. Willingham won't be leaving the field much in 2010. Slotted as a starting running back, defensive back, and return specialist should help to boost Willingham's all-around statistics. Willingham will be leading yet another inexperienced, but talented Olathe East team in this upcoming season and just how well the Hawks do will be much attributed to how well Willingham is able to perform. Two players from Olathe East come to mind--Andre Jones and Derek Miller. Both players were multipurpose stars for Olathe East in the mid 2000s and both were Simone finalists. Willingham will play as important of role as both of those guys had for their respective teams, and should he tear it up, Willingham has a shot at the Simone. Pearl is quite an intriguing player. He split carries in the Hawklets backfield as a junior and churned out 1,400 yards, but he still remains under the radar. 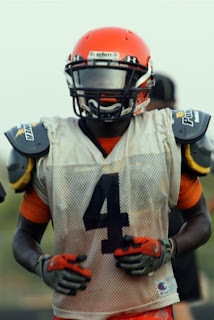 While he projects as as defensive back at the next level his skills at the running back position are undeniable. I see Pearl as an athlete with a boatload of untapped potential. Since Rockhurst runs a fairly balanced offense I think it will be hard for Pearl to surpass 2,000 rushing yards as a senior (the unwritten watermark for Simone Award winning running backs), but I still expect him do do big things for Rockhurst and potentially claim a spot amongst the four finalists for the award. It's not a stretch to call the running back position at Olathe North the "most highly acclaimed" of any position for any team in the metro. When you go back through the years Olathe North has never lacked a big time back. From Arland Bruce to Beno Gore to Darren Sproles, Maurice Mack to Jim Bouknight, Justin to Josh Gore, and the aforementioned James Franklin. Saunders looks to carry on the torch of the elite position in 2010. Saunders is probably the fastest player in the Sunflower League. He won the Kansas Class 6A 100 and 200 meter crowns as a sophomore, and may have repeated the feat this past Spring had he not injured his hamstring before the state meet. With speed to kill, Saunders will continue to be used in a variety of ways by Olathe North head coach Pete Flood--the first of which will be out of the team's highly successful Wildcat formation. Five Olathe North running backs have won the Simone Award, and Saunders has a good shot at being the sixth. The Coffman family bloodlines run rampant throughout Jackson County. The father, Paul, played tight end for the Chiefs in the 1980s. Eldest son Chase plays for the Cincinnati Bengals and won the Simone Award in 2004 at Ray-Pec. 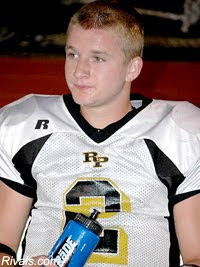 Carson led Ray-Pec to two state titles and is the starting quarterback at Kansas State. Cameron has all the makings of the next great Coffman. With offers from Nebraska, Kansas, Iowa State, Arizona State and Wyoming, Cameron is by no means flying under the radar. In fact he is likely the most talented prep quarterback in the Kansas City metro. Coming off consecutive 2,000+ yard passing seasons Cameron has big expectations on his shoulders for the 2010 season. I initially completed this list with only the aforementioned six players, but something was telling me I was forgetting somebody. Low and behold Gardner-Edgerton's Starling committed to Nebraska several days later and I immediately realized who I had been forgetting. The 6-foot-5 Starling is one of the most dominant athletes the Kansas City Metro has seen in a few years. Not only is he rated by Rivals.com as the 99th high school football player in the nation, but he also boasts a 95 mph fastball and is expected to be selected in the first five rounds of the 2011 Major League Baseball draft. Starling is also a star on the basketball court for the Blazers. As a sophomore Starling passed for 1,141 yards and 11 touchdowns, and rushed for 1,033 yards and 10 touchdowns, in leading Gardner-Edgerton to the Class 5A Sub-State round. Last season as a junior he passed for 1,433 yards and 18 touchdowns and rushed for 1,381 yards and 19 touchdowns in leading the school to its first ever appareance in the 5A state championship. from playing against simmons, willingham, and saunders none are on the same level as miller or starling. seen them all play. saunders is a track guy palyin f-ball. straight ahead runner & slow hips on "d". w-ham is a stud just undersized. simmons is a good athlete but doesnt have a nose for the ball or a mean streak in him. patrols the secondary but doesnt read well as his pic totals show. miller & starling should be the top choices but the name coffman merits consideration. chase won it while missing several games his sr year. give it to starling.